How do you make the popular Festool MFT even better than it already is? You give it a bunch of accessories. 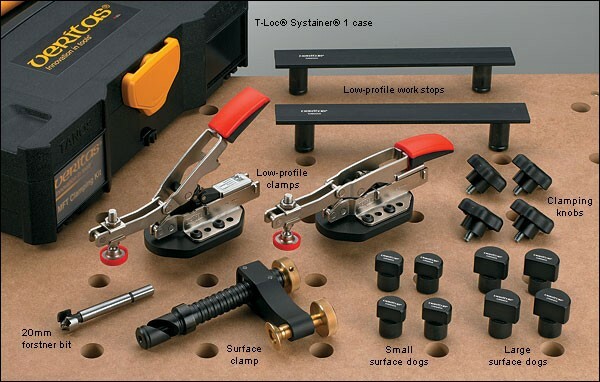 Lee Valley has put together a Veritas bench dog kit that turns the MFT into the ultimate work table. And if you don't have an MFT, they give you the drill bit to make your own. A work table without clamps is pretty useless, but this kit doesn't just come with boring f-style clamps; no, Lee Valley found a way to get the Bessey auto-adjusting toggle clamps to work with the MFT. 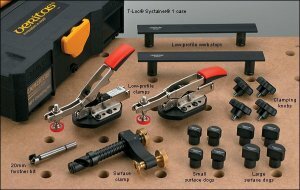 The kit includes two of the Bessey clamps, various surface bench dogs, low profile material stops, a Veritas surface clamp, and clamping knobs. Not everyone has the money to go out and buy a Festool MFT, but don't let that stop you from ordering this bench dog kit. Not only can it work with other benches with 20mm holes, they also include a 20mm forstner drill bit so you can make your own bench top. It wouldn't be a very good Festool accessory if it didn't use Festools Systainer, so thankfully it does. 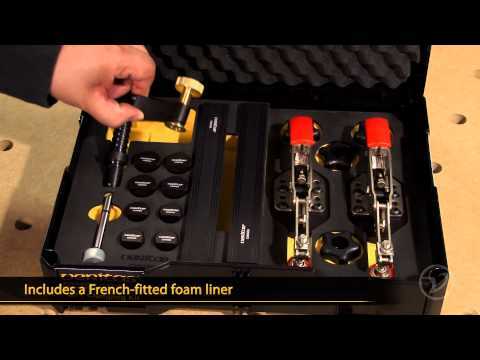 The Black and Gold T-Loc Systainer-1 with Veritas logo comes complete with custom cut foam liners that hold the entire MFT Clamping Kit. The liner also features a yellow contrasting layer so you can easily inventory your accessories before packing up. I agree! If you can go online there are numerous sites where measurements can be...	5 days ago. That would be very cool to have 3 weeks ago.